Tejas Article : Telecom Industry Pricing: Who is eating into whose Share? Telecom Industry Pricing: Who is eating into whose Share? In this article we look at the evolution of pricing in the Indian telecom industry and analyze Airtel�s and Tata Docomo�s post paid plans to identify the strategies underlying these plans. We simulate these plans based on the information provided on the operator�s website for the Mumbai Circle, incorporating the caveats inherent in the plans. The analysis reveals significant crowding in Airtel�s postpaid plans whereas Tata Docomo offers plans at distinct price points, drawing parallels with Verizon and AT&T�s pricing strategy in the American market. The Indian Telecom story has caught everyone�s attention the world over. The number of subscribers in India has crossed the half a billion mark, next only to China1. Along with the subscribers, the number of operators in India has also increased. The entry of new service providers, with MTS & Uninor being the most recent and the operators� pursuit for a stronghold in the telecom market has led to tariff based price wars for attracting new customers. The pricing in the Indian mobile service providers� industry evolved over three phases, with call charges steadily falling through the phases. Indian service providers� pricing evolved over three phases. The first phase was an introduction phase, from 1995 to 2000. The incoming and outgoing calls were priced around Rs 14/minute, which made the service a luxury, attracting significant snob appeal. Eventually the outgoing call prices dropped to Rs 9/ minute and incoming to Re 1/minute (towards the end of this phase), attracting a greater segment of the population. Thereafter, in the Growth phase which lasted from 2000-2005, the outgoing call rates dropped to Rs 2/minute while the incoming calls became free of charge. Many new players entered the market during this period, such as Reliance, which set new benchmarks for pricing. Following an aggressive strategy to attract a huge customer base, Reliance forced other operators to change their plans according to its offerings. Interestingly, what followed is the maturity phase where Tata Docomo used the 1p/second billing to gain entry into the crowded market. Tata Docomo�s strategy is reminiscent of Reliance�s pricing strategy from the growth phase. The other operators reluctantly followed suit and added per-second billing plans to their existing product portfolio. This is one of the reasons for the crowding seen in Airtel�s postpaid plans, among others, as it continues to offer per-minute billing options also. The biggest driver of growth in telecom industry is the development of pricing plans catering to individual needs and requirements of people at the prices they are willing to pay. A plethora of price plans are available today such as prepaid, postpaid, lifetime validity, Closed User Groups, corporate plans or some combination of these. We will restrict our analysis to the postpaid plans as they exhibit individual usage patterns and preferences, which govern the prepaid and Closed User Group plans. We consider the price plans of two service providers at the extreme ends of evolution, Airtel & Tata Docomo. We analyze the prepaid plans of these two subscribers in Mumbai Circle for product line structure, difference across products for different usages and then compare them to international players AT&T and Verizon for positioning. 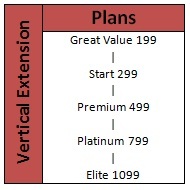 Airtel has a vast product line as shown in Exhibit 1 with 18 offerings2, with several products at same price points differing in terms of call rates for STD versus local usage or with lower call rates to Airtel phones, whereas Docomo has a relatively small product line with individual products at clearly differentiated price points. Two separate trends are evident. These trends are in terms of the kind of usage by the subscriber. Airtel has specific plans that distinguish between local & STD users, and certain other plans that incentivize local calls made to the Airtel Network. 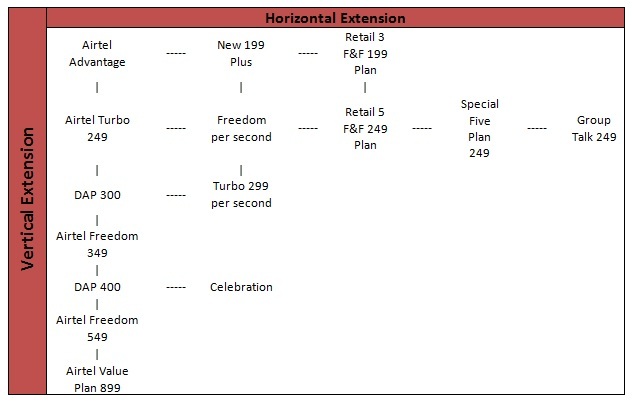 Pricing plans of Docomo (shown in Exhibit 2) have different calling rates for different kinds of usage, but they do not vary across the plans. To compare the pricing plans of Airtel and Docomo, we simulated their usages for durations of 100 to 2000 minutes for different usage patterns. These simulations helped derive insights as to how the price borne by a user evolves as his usage changes under different kind of usage patterns. For local calls to Airtel phones, the pricing is close and intertwined and there is little difference across the plans. Similarly, for local calls to other subscribers, the plans are quite close to each other. Certain plans have lower per minute rates but they also turn out to be costlier throughout due to high rental. The current pricing strategy of Airtel is thus misleading as far as mixed local usage is concerned. The customer has an advantage if a major portion of his calls are to cell phones on the same network but this advantage is also constrained by the specific caveats of the plans. When there is a mixed STD-Local usage, different plans turn up to be cheaper for different duration of usage, but this is a difficult analysis for an average user and could possibly be a pricing technique of the company to exploit information asymmetry. However, we can infer that Airtel uses its pricing plans strategically to increase its market share by giving customers incentives to talk to other Airtel users as it costs less. Such a pricing strategy has a network effect, as more people will adopt Airtel as the user base increases. The plans offered by Docomo are non-overlapping and distinct in terms of the fixed rentals when looked at upfront. The bill that a customer had to pay under different plans was different in each scenario, and followed the expected trend. However, for the high rental plans, which should become cheaper for higher usage, do not become cheap even much beyond 2000 minutes of usage. This implies that it probably is a way for the company to charge more while giving the perception of lesser bills per month. Cannibalization occurs when the same service provider positions two of its products so close to each other that they eat into each other�s market share. As we saw in the previous section, Airtel positioned its price plans quite close to one another, and assuming that other telecom operators will be similar to Airtel in their offering, there is a possibility of cannibalization in the offerings of Indian telecom operators. To illustrate how multiple products at similar price points need not always lead to cannibalization between the products (as of Indian telecom operators), we compare them with the product lines of two major US players, AT&T and Verizon. AT&T has five distinct price points but multiple plans at each price point makes the product line congested. However, what stands out in comparison to the Indian mobile operators is the manner in which the product line is positioned, as in, each plan is clearly positioned by the segment of users it is aimed at. Due to this clear positioning, the multiplicity at same price points will not lead to cannibalization. Though Airtel has a product line similar to that of AT&T, there is no clear positioning of the price plans at same price, which leads to confusion amongst users and cannibalization among individual plans. Verizon has a very clear differentiation of its products � local vs. national. There are clear price points with separate target segments for each price point, which is similar to the product line of Docomo. Due to fewer well-differentiated pricing plans, the chances of plans cannibalizing each other are minimal as each plan targets a different segment. Newest introduction to Airtel�s portfolio is the recently launched per second billing as a follow-up to Docomo�s introduction of this plan to Indian markets. The question is if such a plan is actually cheaper for the consumers at all. 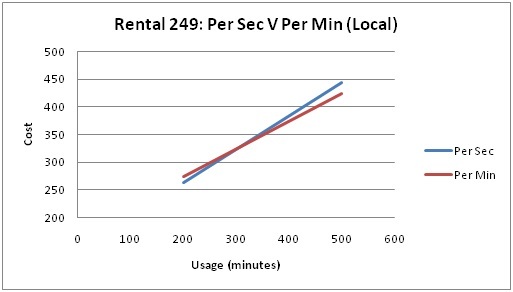 To explore this, we compared the per-second billing plan recently introduced by Airtel with the per-minute plan of same rental. Exhibit 3 shows the results of the comparison. The call charges in per-second billing plans are at an 18% mark-up over the call charges in per-minute billing. As can be seen from the table, a consumer will be better off in a per second billing scenario if and only if, on an average, he talks less than 50 seconds in every minute that he would have been traditionally billed for. As the average call duration increases, the consumer pays extra for each second that he spends on phone over and above 50 seconds. Eventually, if we aggregate the total time spent on the phone and a person manages to talk the exact same amount on his phone without missing �seconds� in every minute that he talks, then the analysis put forth will hold. This will be true if average call size is long, since then the �seconds lost� in the call will get divided by total number of minutes and hence will be very small, making the analysis practically valid. 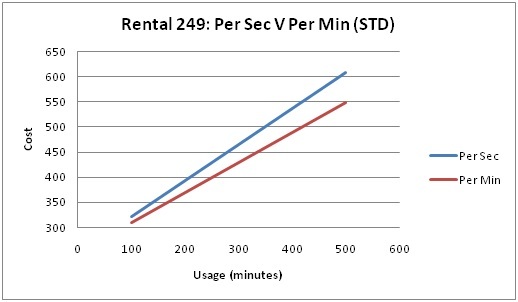 On comparing the two plans for usage amount up to 500 minutes, for local to local usage (shown in Exhibit 4), we see that Per second plan is expensive for greater usage while in STD usage, the per-second plan is always more expensive than the per minute, as shown in Exhibit 5. The per-second plans are thus economical only if the user consistently talks lesser than 50 seconds per-minute, but are expensive for longer call durations. We find that service providers give customers an incentive to talk to other users on same network by providing a lower call rate, using this strategy to increase their customer base. Apart from this, the plans with different rentals do not differ much from each other, and though they seem to provide users specific benefits, they actually are more alike than different and hence confusing. The product line of most of established service providers, which will be similar to Airtel exhibits significant crowding and cannibalization among different plans at same price points as there is no clear positioning of these plans, whereas Docomo has clearly differentiated price plans. In addition, the per-second billing plans, which have supposedly changed the face of Indian telecom industry, are not beneficial for the costumers as are hailed to be. We find that these plans are beneficial to the customer only as long as the average duration per call is less than 50 seconds, and for longer calls, the customers actually end up paying more. Seema Gupta is an Assistant Professor in the Marketing Management Area at Indian Institute of Management, Bangalore. She holds a PhD. from Mohanlal Sukhadia University, Udaipur, India (2001). She also has an MBA from R. A. Podar Institute of Management, University of Rajasthan, Jaipur, India (1991-1993) and a Bachelor of Arts degree in Economics, Psychology and Statistics from Rajasthan University, Jaipur, India. She can be reached at seemag@iimb.ernet.in. Tejas Dave (PGP 2009-11) holds a Bachelor's Degree in Electronics Engineering from University of Texas, Dallas. He can be reached at tejas.dave09@iimb.ernet.in. Maria Cheryl Fernandez (PGP 2009-11) holds a Bachelor's Degree in Electronics and Electrical Engineering from College of Engineering, Guindy, Anna University. She can be reached at maria.fernandez09@iimb.ernet.in. Akhil Gupta (PGP 2009-11) holds a Bachelor's Degree in Electrical Engineering from Indian Institute of Technology (IIT) Kanpur. He can be reached at akhil.gupta09@iimb.ernet.in. Pulkit Jain (PGP 2009-11) holds a Master�s & Bachelor's Degree in Mechanical Engineering from Indian Institute of Technology (IIT) Bombay. He can be reached at pulkit.jain09@iimb.ernet.in. T Srirathivarman (PGP 2009-11) holds a Bachelor's Degree in Electronics and Electrical Engineering from College of Engineering Guindy, Anna University. He can be reached at srirathivarmant09@iimb.ernet.in.